One goal of the Alsea Watershed Study Revisited is to complement the other Watersheds Research Cooperative sites by testing the effectiveness of contemporary forest practices across different watersheds. This study will allow us to compare the impacts of contemporary forest practices with pre-treatment data from 1959 to 1965 and with historic impacts measured during the pre-OFPA era. 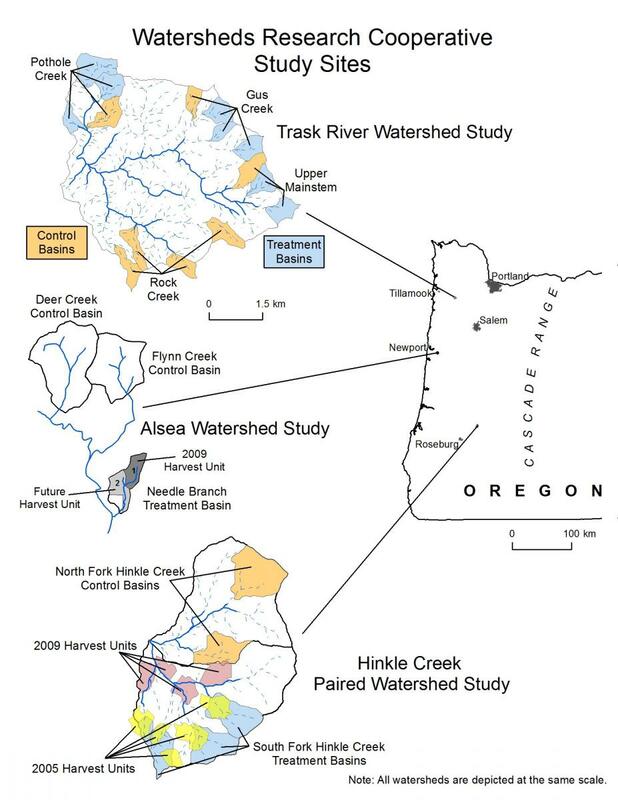 The Alsea Watershed Study was the first paired watershed study in the United States to simultaneously test the effects of forest management practices on flow, water quality, aquatic habitat, and fish. This pioneering study ran from 1959 to 1973 and provided one of the first tests of the use of riparian management zones to reduce impacts from forest activities. Three small watersheds (Needle Branch, 175 acres; Deer Creek, 750 acres; and Flynn Creek, 500 acres) were monitored before and after different treatments. Since the conclusion of the original study these watersheds have continued to be used to study forest watershed processes, including long-term hydrologic recovery, water quality patterns, and biological responses. This has included periodic investigations of flow, water quality (especially nutrients), sediment and bedload transport, dissolved oxygen and reaeration rates, and fish populations for nearly 50 years. The regenerated forests in Needle Branch were harvested again, but the practices used are much different than those used in 1966. Contemporary forest practices are regulated under the Oregon Forest Practices Act (OFPA) and will include protection of streams that incorporates riparian management areas around fish-bearing reaches. Timber removal and reforestation practices are designed to result in fewer disturbances. Read about the Alsea study plans HERE. The purpose of the Hinkle Creek paired watershed study is to test the effectiveness of the Oregon Forest Practices Act (OFPA) and modern logging systems in protecting forest streams during harvest operations. The study tacks important questions about the effects of logging across entire watersheds. The Hinkle Creek study focuses on fish, water quality and aquatic organisms. Set on 5,000 acres of second-growth forest, Hinkle Creek is the first paired forest watershed study conducted entirely on private land. Scientists gathered data on water quality, water quantity, fish, amphibians and aquatic invertebrates. Scientists tracked the movement of hundreds of individual fish throughout the watershed using stationary antennae and over 4400 PITs (Passive Integrated Transponders) implanted in resident cutthroat trout. Read about the Hinkle Creek study plans HERE. The Trask Study is intended to examine the physical, chemical and biological response of aquatic systems to timber harvest at the scale of a single harvest unit and to evaluate responses downstream. The Trask River Watershed Study will examine three different best management practices (BMPs) across three ownerships when harvesting around small non fish-bearing streams. The study will test the effectiveness of these BMPs in achieving stream protection goals. The study is tackling important questions about the effects of logging on fish, amphibians, birds, insects and water quality. In this study, reference areas are being left unharvested, while treatment areas are being harvested under provisions of the Oregon Forest Practices Act (OFPA), state and federal forest management plans, with or without stream buffers of differing widths. This study is taking place on property owned by the Weyerhaeuser Company, the Oregon Department of Forestry (ODF) and the U.S. Bureau of Land Management (BLM). Read about the Trask study plans HERE.